If you are planning a wedding in California and want to obtain a marriage license, you will find that there are two different types of licenses that the state issues – a confidential marriage license and a public marriage license. 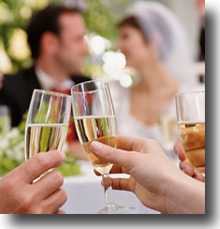 Both, of course, are legal documents and will make your marriage official in either case. However, in addition to general requirements both documents demand, there are additional conditions specific to each, and depending upon your circumstances, you may not have an option to purchase the one you want. 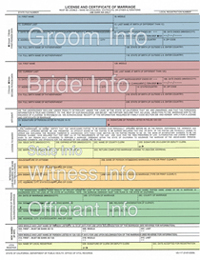 The age requirement for obtaining a confidential marriage license is that you must be at least 18 years of age. Although the public license also has the same age prerequisite, it does allow for a minor to marry with written consent of a parent or legal guardian (there are other stipulations for minors as well). A confidential license does not require any witnesses. The public license, however, does require at least one. You can have two witnesses sign the document, but it is not necessary. If a minister is a California notary public and is authorized by the county, he is able to issue a confidential marriage license, provided he offers the service. Conversely, he cannot issue a public license. Any county clerk’s office within California, however, can provide both. Regardless of the type of license you purchase, both will be registered in the county clerk’s office in the county where it was originally acquired. This is also where certified copies can be obtained. The significant difference is that the confidential marriage license is confidential, and only the married couple can procure copies of it from the recorder’s office. Comparatively, the public license is part of public record, which means anyone can request copies, provided they pay the required fees. If you and your future wife or husband have performed acts in the capacity of a married couple such as living together as spouses, you may apply for a confidential license. If not, you must purchase a public license. As indicated in the latter requirement, if you do not meet this precondition, you must obtain a public license. Technically speaking, however, the documentation regarding the imperatives of what constitutes the performance of acts in the capacity of a married couple appears to be somewhat vague. 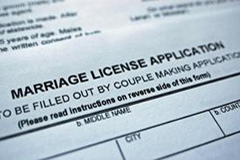 Therefore, if a confidential license is desired – and many people do desire it because of its convenience (an ordained California minister that is a licensed notary public can issue this type of license for you, even at the wedding site on the day of your wedding) – it is suggested to research related documentation to see if your circumstances meet this requisite. 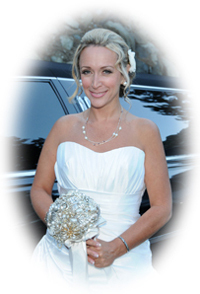 For additional information about California marriage licenses or if contemplating getting married in El Dorado County – the home of legendary Lake Tahoe – visit our website at http://www.laketahoeweddings.net/.